The origins of this dish, as the name implies is from Fujian China. Some say it was devised by Chinese immigrants who brought the noodle dish over from their hometowns, others described it as a dish improvised by Chinese seamen who sought to provide a simple meal for themselves using ingredients easily obtainable at that time while they were in Singapore. Well, it could jolly well be a mixture of both. Whichever the case, we know for sure that it had been around for at least more than 70 years now, as Baba Lee Kip Lee, a Singapore Peranakan recalled in one of his books on his father’s love for hawker food and how the senior Baba Lee would travel all over the island in search of good satay, turtle soup, Nasi Padang, “Hai Lam” beef noodles and of course Fried Hokkien Prawn Mee from Hokkien Street, just bordering Hong Lim Park. That area, was the enclave of the early Hokkien community in Singapore, stretching from Telor Ayer Street where Thiam Hock Keng is located, all the way to the New Bridge Road-Eu Tong Sen Street boundary, beyond which lies Ellenborough Market and Clarke Quay, the territory of the Teochews known to them as 柴船头 “Cha Zun Tau”, where the humble beginnings of many Teochew delights like Bak Chor Mee came from. Anyway, I have digressed. Though the ingredients are down to just a handful, the preparation process is quite long, especially in the making of the broth base. 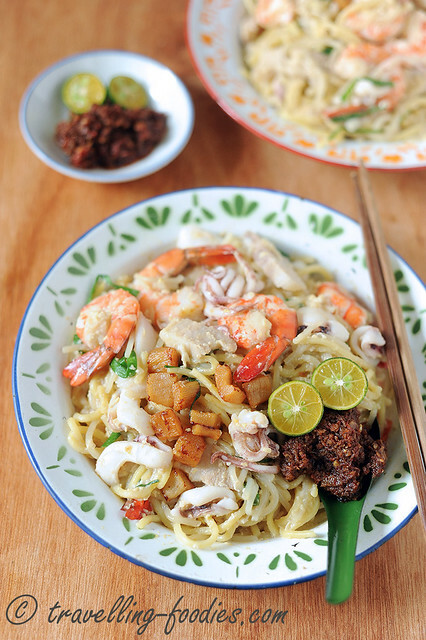 The origins of the dish may have been from Fujian China but it has since been successfully “naturalised” to become a truly iconic Singaporean dish, with the addition of calamansi lime (sng kum or limau katsuri) and sambal belacan, Chives was a commonly available vegetable then and hence added to many local noodle dishes, like Fried Hokkien Prawn Mee, as well as Mee Siam and Char Kway Teow. It has since been “decommissioned” in our local Char KwayTeow for an interesting reason, though the practice is still observed in the Penang version. 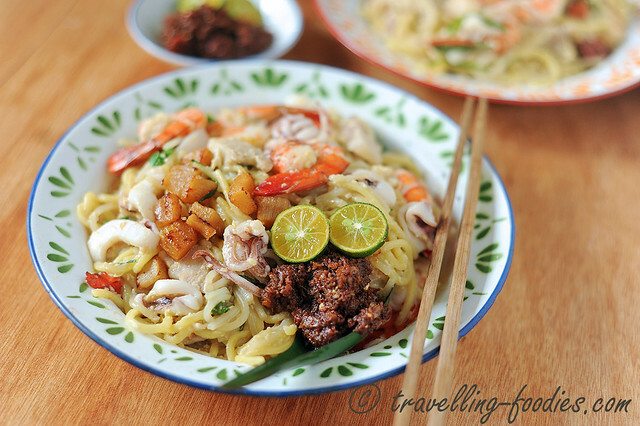 Others like prawns, squid, pork belly meat are staples to a good fried Hokkien Prawn Mee, and of course fried crispy lard croutons, affectionately known here as “bak yew pok” is an absolute must! Like I’d said earlier, the devil lies in the broth, concocted from two prime ingredients, pork bones and ribs as well as prawn shells and heads. They are prepared separately before being combined to maximise their flavours and of course their potency for the dish. Though it is a noodle dish, the essence of it really lies in the broth base, which is either a make or break. I used a mixture of one kilogram worth of pork knuckle bones, pork ribs and not forgetting that slab of pork belly that would eventually be sliced thinly and incorporated into the frying of the noodles as well. The pork knuckle and pork ribs are boiled for more than an hour before being left to steep overnight. The next day, the broth is “freshen” again by another round of reboiling before being strained and combined with prawn stock. The prawn stock is made by first sauteeing a good amount of prawn exoskeletons in some lard oil to extract all the flavours from within before being boiled for 20 min or so with sufficient hot water. Take the effort to crush the heads to release more juices packed within. The prawn stock is then strained and combined with the pork broth, and kept warm at all times during the noodle cooking process. I know some folks who add ikan bilis aka gkang hu knuah (dried anchovies), hae bee (dried small shrimp) as well as pnee hu (dried sole) to sweeten the broth. These are viable options which I have yet to explore, with the intentions of keeping the flavours simple. 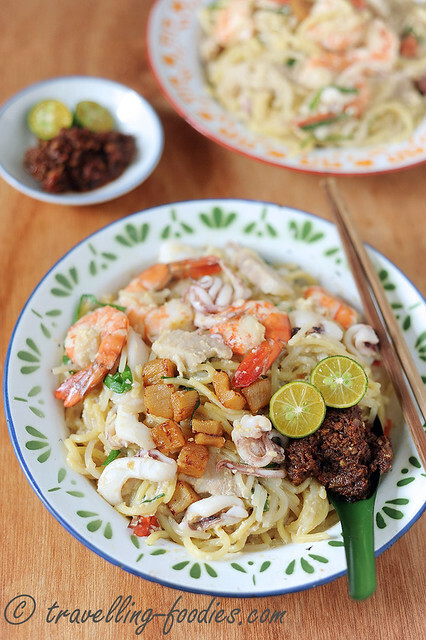 Avoid frying the noodles in a large batch as the noodles would end up being braised too quickly instead of taking on the quintessential wok kei all good Fried Hokkien Prawn Mee should have. I did 2 servings at a time in my 32 cm wok, using the hottest and strongest flame my kitchen stove could conjure. Speed is of essence to get the flavours worked up as quickly as possible before stewing the noodles in the prepared pork and prawn broth. That said, our kitchen stove is not quite hot enough to get the dish fired up for the needed wok hei compared to the commercial ones used by the street hawkers. So we have to somewhat manage our expectations on the “homecooked” version. Caveat emptor! To make pork broth, rinse pork ribs and knuckle bones thoroughly with water and pat dry. Add some oil into a heated wok and pan fry the pork bones until slightly brown. Pour 2 litres of boiling water into the wok until the bones are almost completely submerged. Return the water to a boil for 5 min before lowering the flame to medium and simmer for 1 hour. Skim off any scum on the surface periodically. Turn off the flame and let the pork stock steep overnight. Next morning, reheat the pork broth again and boil for another 20 min or so before straining. Set aside the hot pork broth. To make prawn stock, add some oil into a heated wok and pan fry the prawn exoskeletons until they turn orangey red and aromatic. Add 1 litre of water of water and boil for 20 min uncovered. Use the back of the spatula to press down on the heads to release the juices trapped within. 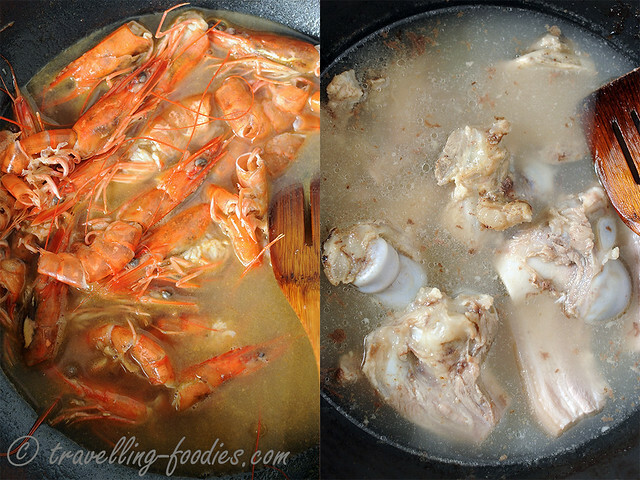 Strain the prawn stock and combine with the pork stock. Boil down to about 1.5 litres to concentrate the flavours. During the process of boiling down the combined stock, add the slab of pork belly and boil until it is just cooked. Remove from the stock and set aside to cool down slightly before cutting into thin strips. Using the boiling stock that is reducing, blanch the peeled prawns and chunks of squid separately until they are just very slightly undercooked. 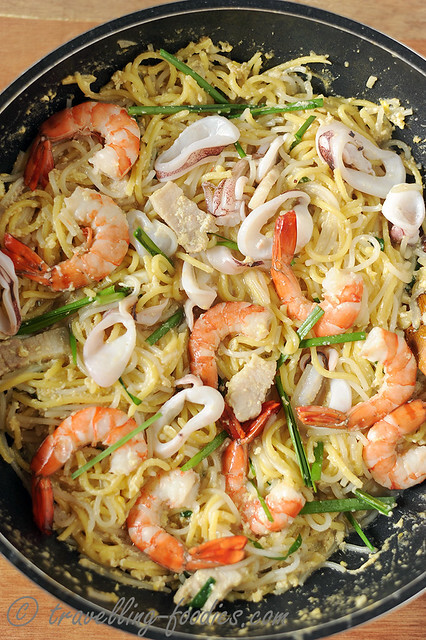 Take note not to cook the seafood too much as they will be cooked again during the frying of the noodles later. To cook 2 portions of the noodles, first add 2 tbsp of lard or cooking oil into a heated wok. Add a portion of minced garlic and saute until aromatic. 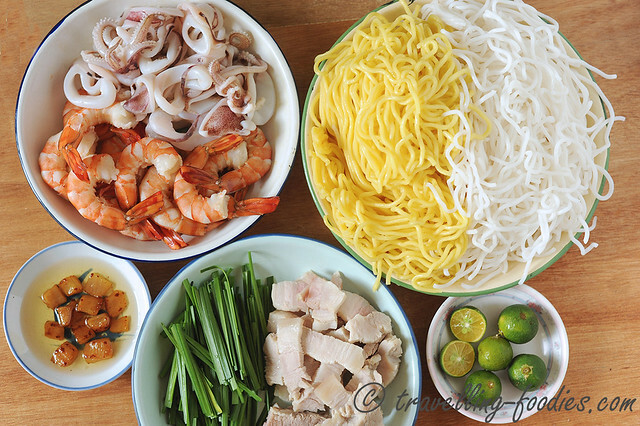 Add a portion of yellow noodles and rice vermicelli, as well as some fish sauce and light soya sauce. Quick stir fry under very high heat for 30 seconds or so. Push the noodles to one side and crack two eggs into the wok. Quickly stir fry the eggs to cook slightly and while the eggs are still slightly runny, combine quickly with the noodles and coat the strands thoroughly. Add a portion of pork belly strips at this juncture. Pour about 300 ml of combined stock over the noodles and stir fry slightly until the stock is absorbed. Add another 300ml of stock and cover for 2 minutes or so. Remove wok cover, add a portion of blanched prawns and squid and a small amount of stock. Add chopped chives now and stir fry until the chives just begins to wilt. The noodles should still be reasonably moist and the seafood just cooked and still very succulent. To serve, plate up and add a generous portion of crispy fried pork lard croutons, as well as calamansi lime halves and sambal belacan on the side. Repeat the process with subsequent portions of ingredients. This entry was posted on November 1, 2015 by Alan (travellingfoodies). It was filed under Food, Simple Eats and was tagged with chinese cuisine, chives, fried, Fried Hokkien Mee, noodles, pork belly, pork lard croutons, pork ribs, shrimp, soup base, squid. I noticed that that the yellow noodle looks thinner than usual one. Care to share where did you get it?